As you may know penguins are not afraid of a little bit of cold and snow. This penguin loves the snow and he loves to play out with his little wooden sledge and go of the steep hills. A good penguin of course wears a nice colourful winter hat and sunglasses. If you need a fun t-shirt with a penguin on a toboggan then this is your shirt. And no worries this shirt comes in kids and adult version and of course in different colors. 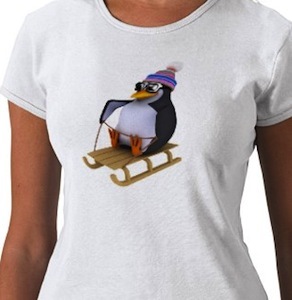 Time to get ready for snow with this Sledding Penguin T-Shirt.